At first glance, sushi seems rather simple—rice, raw fish, a topping, and…that’s it, right? Not exactly. When you take a closer look at sushi, you’ll find that great sushi is a true work of art. The world’s best sushi makers know this and are passionately committed to perfecting their craft. And when the ingredients are so simple, every ingredient and factor must be taken into consideration. This is why chefs obsess over every last detail of sushi preparation. At Nikko Restaurant, we seek this same level of perfection. We know that the simplest foods can be the hardest to master, and we aspire to provide our guests with elegant, balanced, and perfect sushi. In addition to sashimi, our menu includes nigiri sushi—vinegared rice with a topping and draped with raw fish—and maki sushi—cylindrical pieces rolled together using a bamboo sushi mat. Come see why we were voted “Best Sushi Experience by The Best of Charlotte”. 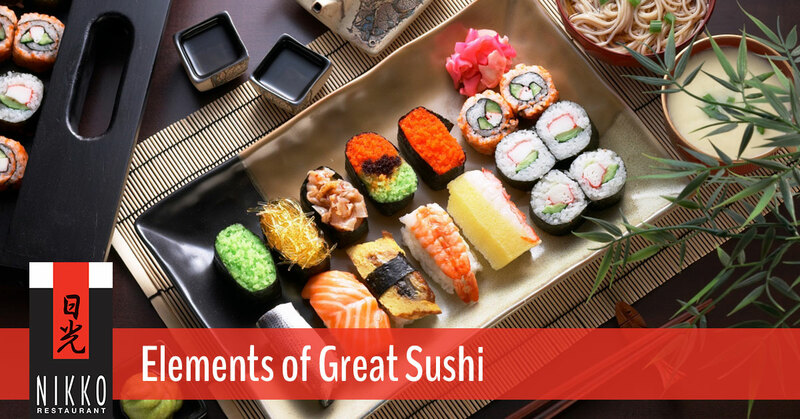 Read on to learn about what makes great sushi great. It all begins with the rice. In fact, the word sushi actually refers to the mixture of rice and vinegar, not raw fish. In western culture, rice is often viewed as a starchy staple that can’t be messed up and therefore doesn’t demand much attention when preparing. In Japanese culture, this is not the case. There is a high premium placed on rice and its preparation. And for sushi, the rice needs to be the perfect texture and have the right level of stickiness. If this is not achieved, it will fall apart when you lift it to your mouth. However, the difficult part is that you do not want your rice to be too sticky and dense, because once you put it into your mouth, it should easily fall apart, allowing you to fully experience the piece of sushi. The trick to nailing this perfect consistency is in the preparation of the rice and the rolling of the sushi. You have to apply just the right amount of pressure to make the outer layer more densely packed than the inside—a skill that can take years to truly master. Being an island in the middle of one of the world’s most bountiful seas, Japan naturally has an array of fish-centric foods. And perhaps the greatest—and most delicious—showcase of their love for this protein is sushi. What people often forget about sushi is the thought and attention that goes into its preparation. At Nikko Restaurant, for example, we only get fresh, quality fish. We age it properly, massage it to the point of optimal tenderness and texture, and we make sure that it is cut perfectly—the cut is vital to the texture. Depending on the type of fish, salt and vinegar may be added to reduce the moisture level. And the result of all of this is a bright, clean, and exquisite piece of fish. This is truly just the tip of the iceberg. Preparing great sushi is a work of art. If you are ready to try the best sushi in Charlotte, come visit Nikko Restaurant. We also have a large menu with a great selection of authentic Japanese foods and drinks. Check out our full menu here!